By Adam Savage on Dec. 15, 2015 at 8 a.m. I'm pleased to give credit for this popular phrase from MythBusters to ballistics expert Alex Jason. 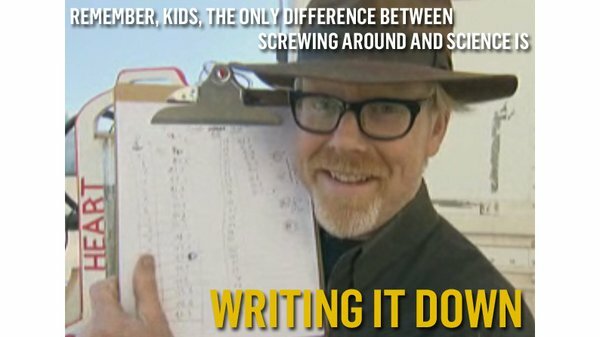 Since I get asked this question a lot, I thought I'd talk about where the "remember kids, the only difference between screwing around and science is writing it down" expression came from. Its origin derives from the 2012 MythBusters episode, Bouncing Bullet. The myth, from a scene in Burn Notice, was whether bullets could skip off the pavement and into a car. We had a devil of a time doing such a thing safely, but with the help of our frequent contributor, ballistics expert Alex Jason, we succeeded. The shoot was a tough one, but once we had all of our data, the result was clear. Alex turned to me and said the quote in question. The SECOND he said it, I told him that I was going to say it on camera, and that it would be a big hit of a phrase. He said that was fine with him, so I used it later in the Titanic Survival episode. Alex thinks it's hilarious that it's gone so viral. I'm pleased to give him credit.